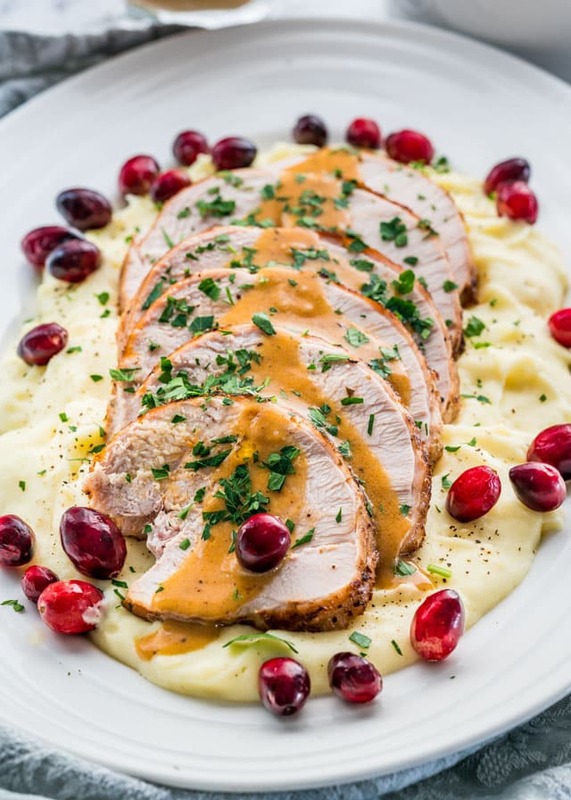 This super easy Instant Pot Turkey Breast is made in a fraction of the time and you’ll end up with the juiciest turkey breast ever, plus make your own gravy right in the instant pot. 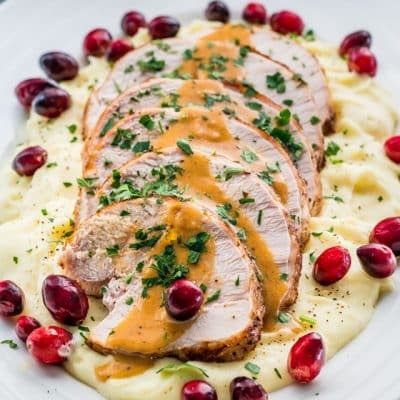 My love for the Instant Pot continues and I have to say that after trying turkey breast roasted in the oven or made in a slow cooker, my favorite way right now is made in the Instant Pot using the high pressure method. The reason is simple and beside the obvious reason that it’s faster. I find that this results in the juiciest turkey breast out of all the other cooking methods. This is coming from someone who loves dark meat because I find that there’s more flavor in the dark meat, plus it’s not as dry as breast. However, the Instant Pot made me a believer in juicy turkey breast. But let’s talk about the obvious here. Roasted turkey breast in one hour, my friends! Can’t beat that especially when you’re crazy busy cooking a hundred other dishes for Thanksgiving. Plus you’re saving your oven for all the other goodies like making lots of cookies. You can also sear the breast right in the Instant Pot to get that nice golden brown color that we all love. I love the idea of cooking only a turkey breast because whenever I cook a whole turkey I have enough for days. Trust me I do get tired of eating leftover turkey, especially when both hubs and I don’t do leftovers. Another alternative is cooking just the turkey thighs, also perfect for a smaller crowd. However, I had a 4 pound piece of turkey breast here. This should be enough to feed 8 people 4 very hungry people. I have the 6qt Instant Pot and I could have easily cooked a much bigger piece of turkey in it. The great thing here is that you will end up with turkey drippings to make some gravy. You can make the gravy right in the Instant Pot using the Saute setting. Very handy and all done in one pot, which is my favorite thing because there’s only one pot to clean. I love to add half and half to my gravy to make it creamier but that’s totally up to you. 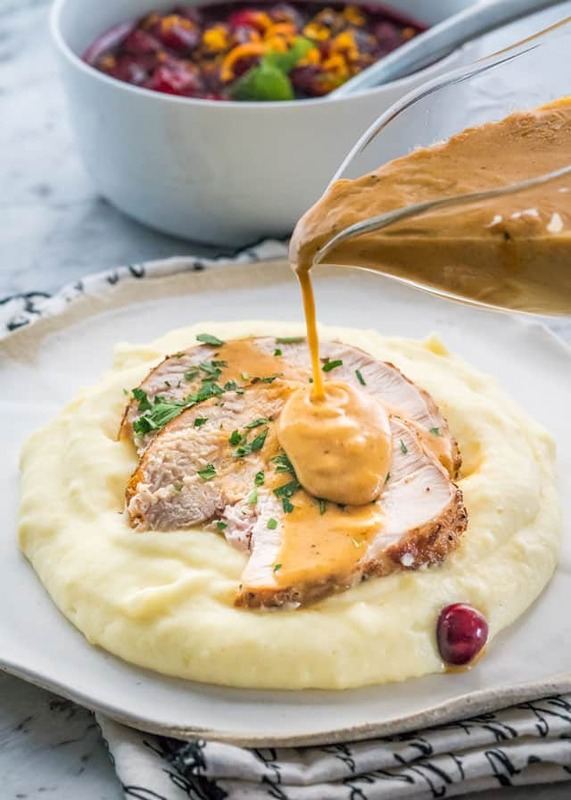 However, you will end up with the most incredible gravy because as the turkey cooks you get all those juices dripping to the bottom of the instant pot; nothing gets wasted. Absolutely! Check out the recipe notes for instructions on how to make this in the slow cooker, keep in mind that the instant pot also has a slow cooker method. Some of you have said in the past the slow cooking is still the best, well that option is available to you, you can definitely cook this on low for about 6 hours and you’ll still end up with a super juicy turkey breast. The general rule of thumb for cooking poultry in the Instant Pot is is 6 minutes per pound with a 10 minute NPR (Natural Pressure Release). 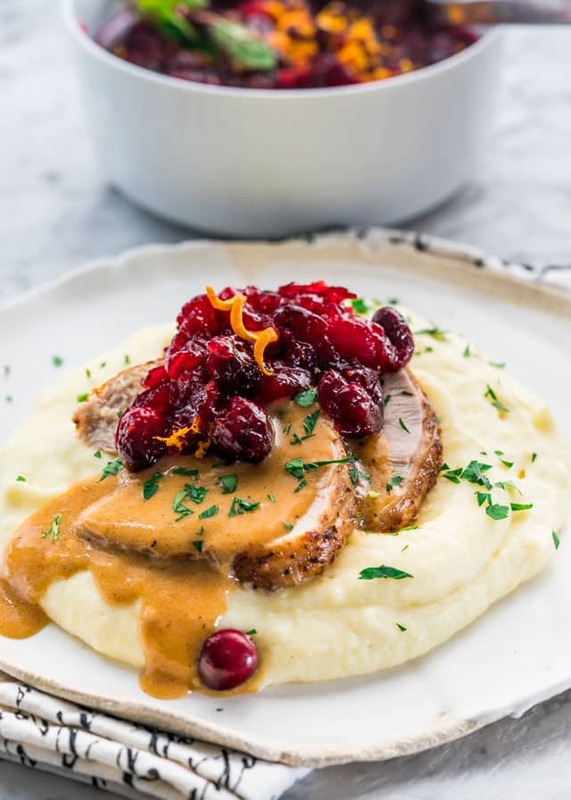 This super easy Instant Pot Turkey Breast is made in a fraction of the time and you'll end up with the juiciest turkey breast ever, plus make your own gravy right in the instant pot. Drizzle the tbsp of olive oil all over the turkey breast and rub it in. I usually do this so that the spices stick to the turkey breast. Rub the turkey well with the smoked paprika, Italian seasoning, tarragon, salt, and pepper. Finish with the minced garlic. Turn the Instant Pot to the high saute setting. 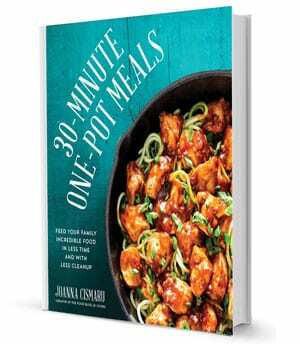 (See your manufacturer's guide for detailed instructions on how to use your instant pot). Add the 2 tbsp butter and oil and once your instant pot reaches the desired temperature (the timer will start to count down) add the turkey breast. Sear the turkey breast on all sides. Should take about 5 to 8 minutes. Transfer the breast to a plate or a cutting board. Add the Instant Pot's wire rack, then place the turkey on top, as seen in the video. Close the lid (follow the manufacturer's guide for instructions on how to close the instant pot lid). Set the Instant Pot to the Manual setting and set the timer to 25 minutes on high pressure. 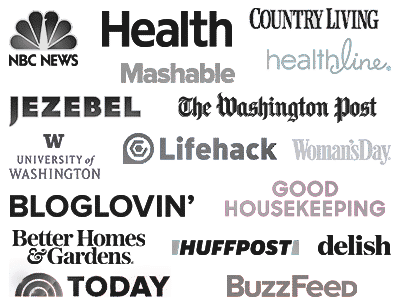 Once the Instant Pot cycle is complete, wait until the natural release cycle is complete, should take about 10 to 15 minutes. Follow the manufacturer's guide for quick release, if in a rush. Carefully unlock and remove the lid from the instant pot. Transfer the breast to a cutting board, cover completely with aluminum foil and let it rest for 10 to 15 minutes before cutting into it. Make sure to remove the butcher twine before slicing it. If crispier skin is desired, broil it in the oven for an additional 5-10 minutes. Turn the Instant Pot to the high saute setting (don't discard the turkey drippings). Add the 2 tbsp of butter and cook until the butter is melted. Whisk in the flour with the butter and cook for a couple minutes, stirring or whisking constantly, until the flour loses its raw smell. Whisk in the chicken broth and cook and half and half and cook for an additional 3 minutes or until thickened. You can omit the half and half and just use 1 cup of chicken broth or turkey broth. I used half and half for a creamier gravy. Season with salt and pepper as preferred. I used a boneless piece of turkey breast, sometimes it comes in a box and it usually has butcher twine all around it. You can of course, use a large turkey breast with bone in. Please note: NO ADDITIONAL LIQUID is needed in the Instant Pot, however some people have been having issues with their Instant Pot reaching high pressure, so if you wish you could add a cup of liquid, either water or chicken broth. I DID NOT use the poultry setting on the instant pot, you must use high pressure. Other herbs that you can use and go well with turkey include thyme, rosemary, sage, oregano or marjoram. Searing the turkey breast before actually cooking it in the instant pot is an optional step, however, it does give the turkey an incredible depth of flavor, plus it gives it that nice golden brown color. Searing over high heat caramelizes the surface of the meat, giving it incredible complex layers of flavors. Slow Cooker Alternative: Season the turkey breast as instructed then place the turkey breast in the slow cooker. Cover and cook on low for 5 to 6 hours. Check the internal temperature and make sure it's at 165 F degrees, otherwise cook it longer. If crispier skin is desired, broil it in the oven for an additional 5-10 minutes. Nutritional information includes gravy. Please keep in mind that nutritional information is a rough estimate and can vary greatly based on products used. Just got my IP and excited to try your recipe first. Can you cook from frozen or thaw it first? You can cook from frozen, but it will take a bit longer, I would double the time. It turned out great! I have never used half and half in gravy before and it was awesome! Just bought the power the Power Quick Pot. I think I can use same directions for IP. I am going to start with your turkey breast recipe….it looks great.